Fitwel and GRESB are partnering to make health part of investment decisions. 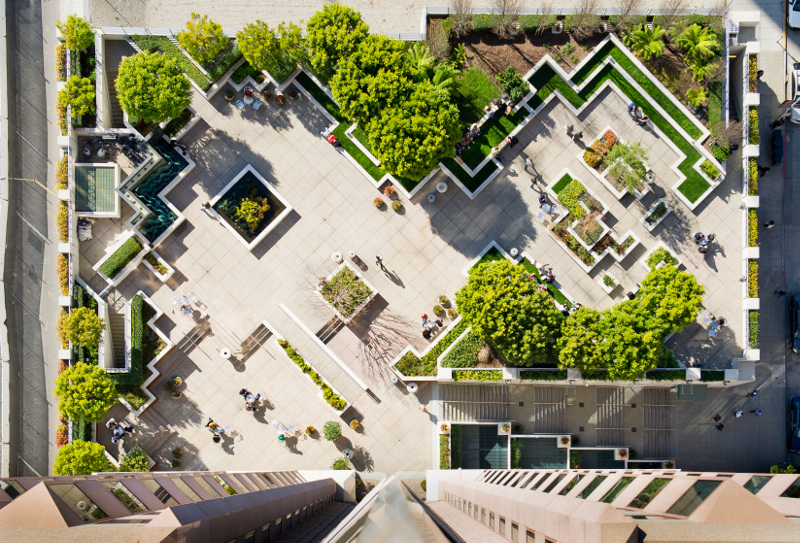 The outdoor plaza at 100 First Street in San Francisco. This is a Kilroy Realty building which was awarded a Fitwel 2 Star Rating. Kilroy Realty is a Fitwel Champion and also the 2017 North American office leader in sustainability recognized by GRESB. It isn’t easy fitting fitness and healthy habits into a busy workday. But now two groups are working together to encourage investment in commercial building design and operations that make it easier for employees to adopt healthy habits such as walking more, sitting less, and eating fresh food. The Center for Active Design (CfAD), which operates Fitwel, and the Global Real Estate Sustainability Benchmark (GRESB) have formed a partnership to help commercial real estate investors efficiently assess the health-promoting aspects of a real estate portfolio. The goal is to optimize design and operational strategies in commercial real estate so that people who work in these buildings are likely to engage in activities that promote physical and mental health. GRESB is also working closely with Delos, creator and leading consultant for WELL Building certification, which competes with Fitwel in some applications. WELL certification is also linked to the Health and Well-being module in GRESB. GRESB assesses real estate portfolios based on their environmental, social, and governance (ESG) performance. Institutional investors use GRESB’s benchmark analyses to compare the environmental impacts of investments. For example, GRESB helps investors analyze greenhouse gas emissions, energy consumption, and energy use intensities. Now GRESB is working with CfAD to help participants improve their ESG performance within the Health and Well-being module. “We are very happy to be partnering up with Center for Active Design, who has initiated Fitwel, because we do believe that health and well-being is something that more and more investors care about, and, more predominantly tenants care about and employers care about,” said Roxana Isaiu, director of ESG and real estate at GRESB. CfAD certifies buildings under Fitwel that encourage healthier activities such as using the stairs rather than an elevator, taking public transportation instead of driving, and spending time outside. Fitwel was created by the U.S. Centers for Disease Control and Prevention (CDC) and the General Services Administration (GSA). It promotes design strategies that are based on evidence-based public health research. Since CfAD took over the operation of Fitwel, more than 600 commercial projects have committed to earning certification. Through its work with GRESB, Fitwel will help companies make health a priority in their portfolios. An investor can use Fitwel’s online tools to benchmark and certify their portfolio of buildings and use that to comply with the GRESB rating system. “Compliance with Fitwel across your portfolio can be recognized as a way to comply with the GRESB rating,” said Joanna Frank, president and CEO of the Center for Active Design. According to GRESB, the reporting burden on asset owners and fund managers should be reduced as a result of this partnership.